Children learn to love liturgy by seeing it, by being around it. 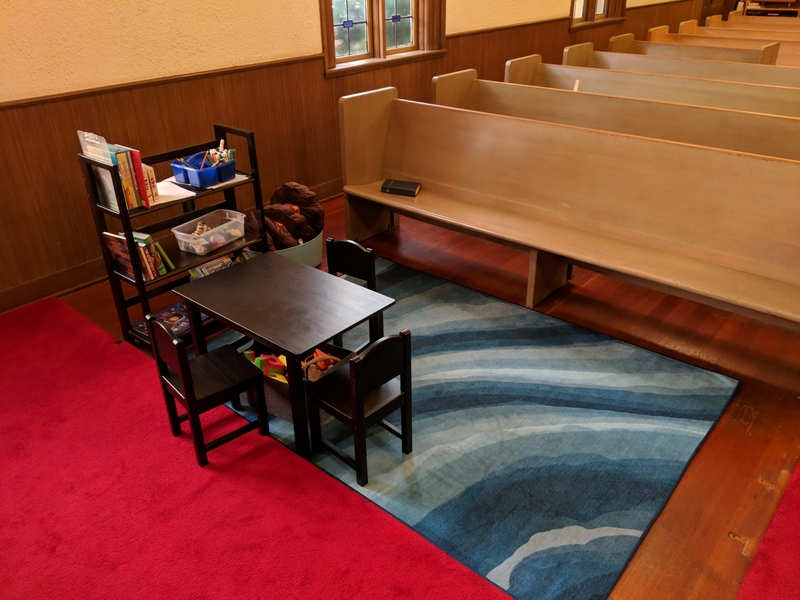 The Pray-ground at the front of the sanctuary is a space for children where they can play quietly, worship, and participate in the Sunday Eucharist as they are able. They can see everything, and get a quiet explanation for what is going on. It has coloring items, reading material, and soft toys for children of all ages. Members of the community volunteer to sit near the Pray-ground from time to time, whether or not they have a child worshipping in the Pray-ground. This sharing the responsibility of caring for our children is what community is all about. All children and parents are welcome, but if parents need a break, sit a few pews away. Kids love the Pray-ground! Read more about Pray-grounds including this great FAQ from Grace Lutheran Church in Apple Valley, Minnesota. On the 1st and 3rd Sundays of the month, we offer “Godly Play,” a method of Christian education and spiritual direction for children. The goal of Godly Play is “to teach children the art of using religious language — parable, sacred story, silence, and liturgical action — to help them become more fully aware of the mystery of God’s presence in their lives.” Rooted in the Montessori tradition, Godly Play was developed and classroom tested for more than twenty years by Episcopal priest, author, and teacher Jerome Berryman. Visit Jerome Berryman’s Godly Play® website. The Godly Play method is currently being used in churches of many denominations throughout the United States, United Kingdom, Australia, and Canada. Since 1991, Godly Play has spread to nearly 1000 churches and institutions. 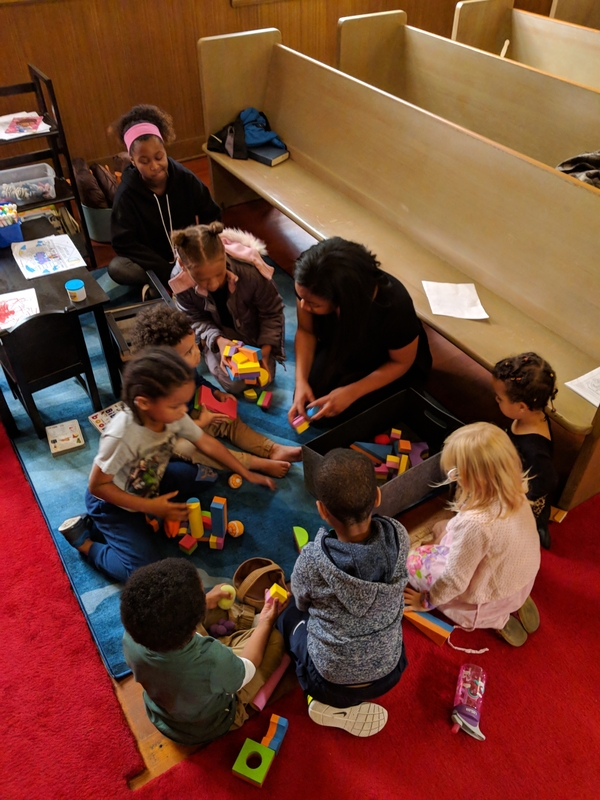 During a typical Godly Play session children are greeted, told a sacred story using special materials, and are engaged in a series of “I wonder” questions allowing them to explore the relationship between the story and their lives. The session concludes with children working with materials of their choice to express and “meditate” on the story in an artistic and kinesthetic way. In this way, Godly Play helps children know God — not just know about God or the Bible. While Godly Play is very structured in its format (the same way that liturgy is), it encourages children to explore their questions through work with art materials. In this way, the program gives children both the kind of structure they need and the freedom they need to work based on their own different personalities and interests. We believe that this approach is uniquely suited to forming children within an Anglican or Episcopal spiritual tradition — one that values both a way of doing things that has flow and grace and cultivates a spirit of experimentation and freedom. St. Philip takes seriously the safety of our children, and our adults. We follow our diocesan policies regarding Safe Church training. All those who work with children and adults, have taken Safeguarding God’s Children and Safeguarding God’s People.